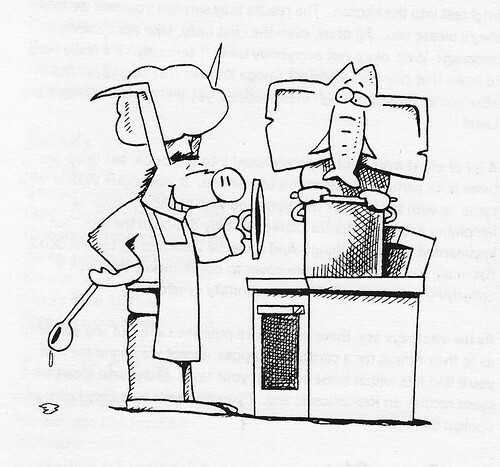 It’s been 14 years since Recipes for a New Majority: Cooking From All Your Favorite Democrats was published, so I can’t remember for certain, but I think I helped proofread it. Recipes for a New Majority is a compilation assembled by the Democratic Party of Oregon, and Scott and I were friends with one of the co-editors. In fact, Scott’s illustrations are featured prominently in the book. I believe Recipes for a New Majority was done as a fundraiser, but I don’t remember whether it was sold or given away as part of a bigger project. 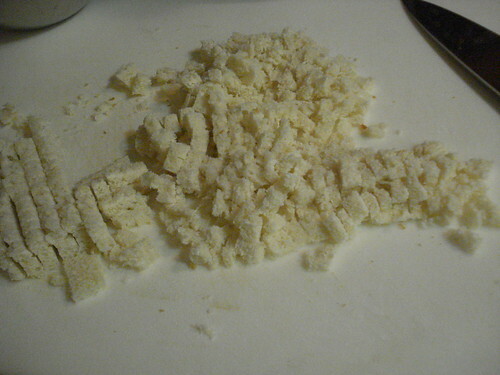 It does feature a lot of recipes from leading Democratic figures, from all over the country; some are still prominent, such as Ron Wyden, then Congressman, now Senator (Democratic Chicken Chili), and Hillary Clinton, then First Lady, subsequently Senator, now Secretary of State (Chocolate Chip Cookies). A few contributors have several entries, most notably then-Sen. Paul Simon. He must have had more free time than you’d expect. 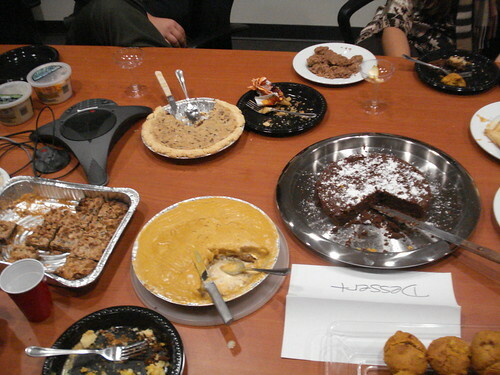 The recipes are varied; New England corn chowder, barbecued baby beef ribs, Cajun deep fried turkey, vegetarian lasagna. 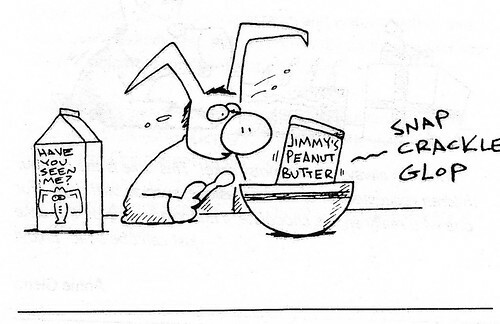 I briefly toyed with the idea of making “Mike’s Nutritious Snack,” a contribution from former Congressman Mike Kopetski, which makes up in simplicity what it lacks in elegance. Put Rice Krispies in a bowl, like you would if you were going to have a bowl of cereal. Arrange half spoonfuls of peanut butter (gourmets call it “dollops”) over cereal. 8-10 dollops should do. Pour a cereal size portion of milk over all. Eat and enjoy. 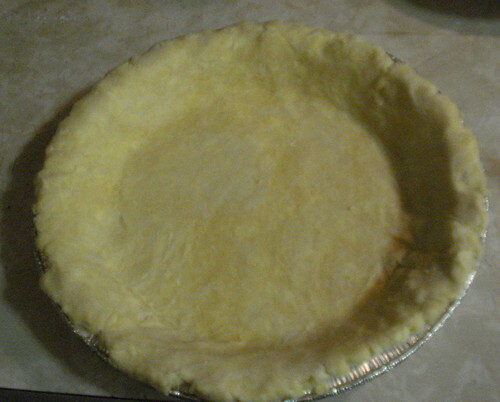 Instead, I chose to make Kentucky pie, a contribution from Sen. Wendell H. Ford. I had no particular attachment to Sen. Ford, but I thought that the recipe sounded like it would produce something similar to Derby Pie, which is a Kentucky specialty; I’ve enjoyed it on both of my trips to Louisville. 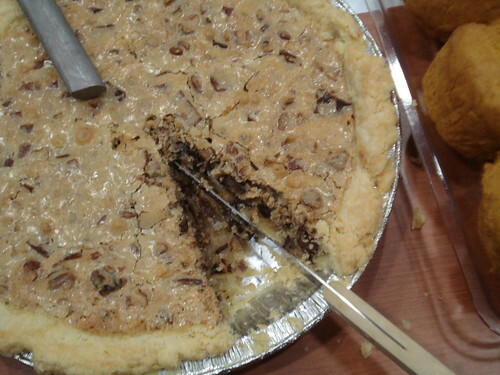 Of course Derby Pie is trademarked and carefully guarded, but it’s not surprising that there are lots of variations out there, and I thought the combination of pecans and chocolate in a dense filling would be well-received by my co-workers at today’s potluck and cooking contest. 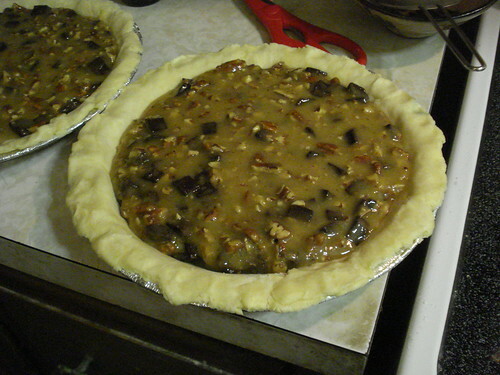 The pie itself is easy to prepare. I started by making a pie crust — two, actually, so I could have one for the potluck and one for Thanskgiving — using a recipe from Mark Bittman’s How to Cook Everything (but I’ve used that recipe before, so it doesn’t enable me to knock off that book too). 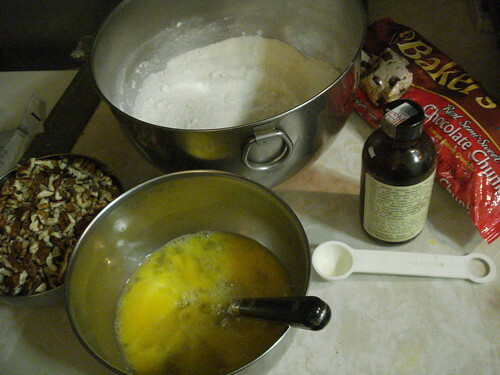 For the filling I chopped pecans, melted butter, beat eggs, blended flour and sugar, and then mixed it all together with chocolate chunks and vanilla extract. I turned the mixture into the pie shells and baked them at 325 for a bit over an hour. Once the pies had cooled I put them in the freezer. One is to keep until Thursday; I wanted the other to be good and cold this morning, because I was also bringing an ice-cream pumpkin pie to the office and wanted to make sure it was well insulated against melting. And it worked: Tupperware salad bowl, Kentucky pie underneath, bag of ice cubes on top, and by the end of a half-hour commute the ice-cream and pumpkin concoction had barely begun to soften. I set the Kentucky pie to thaw so it would be easy to serve when the potluck began at 4. The potluck was a tremendous display of talent and skill. 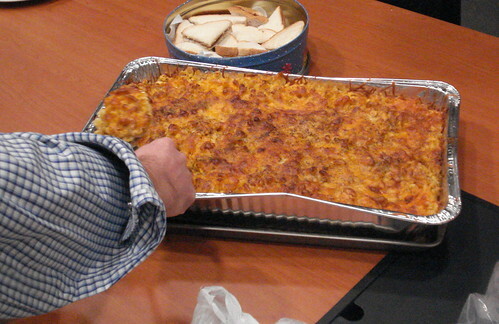 The spread included dips, muffins, mac and cheese, and loads of dessert. 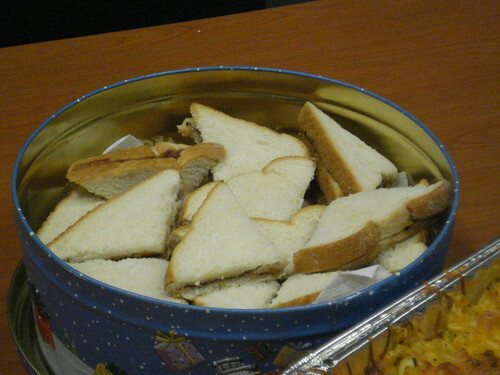 The offerings ranged from simple — peanut butter and jelly sandwiches, cut into triangles — to elaborate — flourless chocolate cake umolded and dusted with sugar just before showtime. And the drinks! We all learned about the cocktail called the bee’s knees, which blends gin and honey syrup and bitters and lemon and did I mention gin? There was definitely gin in there. 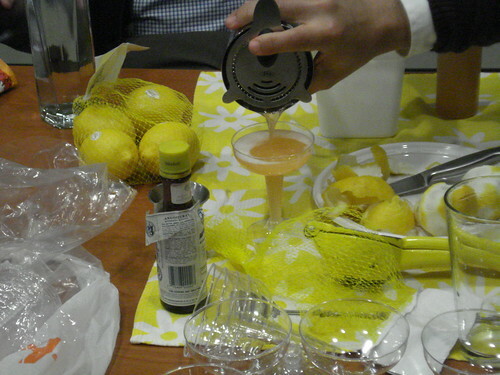 The elaborate mixology was in fact the bee’s knees. A bit of gin later, I agreed to be one of the judges for the appetizers and sides category, and happily sampled more food. This tasting duty also had the advantage of helping offset the gin, which was important since I still had work to do before leaving for the day. After we’d all made some dents in the non-sweets categories, I got things started by cutting a wedge of the pumpkin ice-cream pie, then one of the Kentucky pie. This encouraged others, and soon people were digging in. 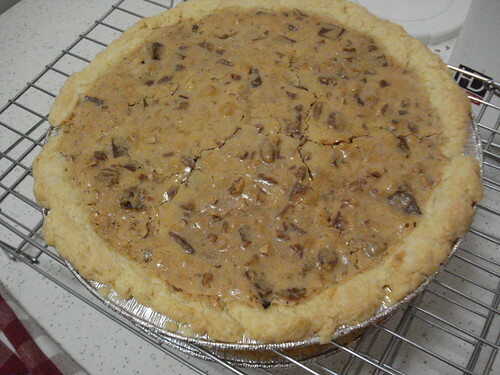 The Kentucky pie went over well; people liked the chocolate and the nuts, the dense filing, and the contrast of the sweet interior with the plain pie crust. I think they also appreciated the fact that it wasn’t as drippy as the gradually melting ice cream pie, though they seemed to be enjoying that one too. 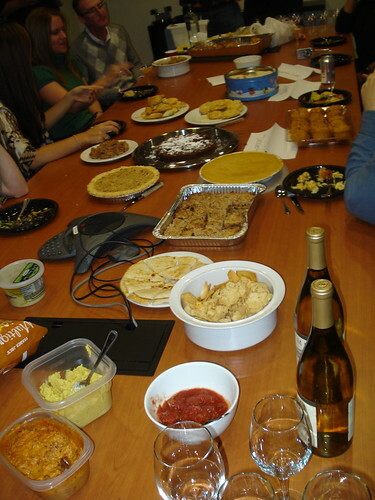 The potluck rolled on, the co-workers wandered in and out of the room nibbling more food, and at some point we remembered that we never got around to finishing the judging. Category judges were instructed to confer and get the results in tomorrow. So stay tuned; I’ll let you know if the Kentucky pie came away with the ribbon. Verdict: Success, even without the votes in. Really, I think we’re all winners today. I’m Just Here for the Food: Meatloaf, Again? 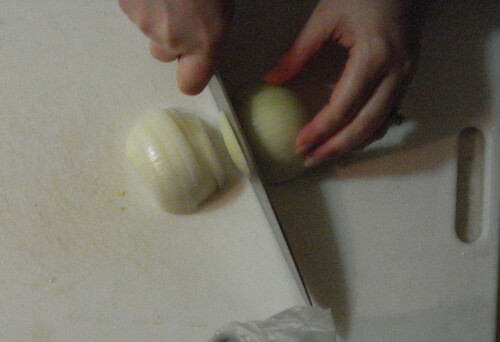 I’m Just Here for the Food Version 2.0 is Alton Brown’s compendium of cooking techniques with recipes included as illustration and demonstration. 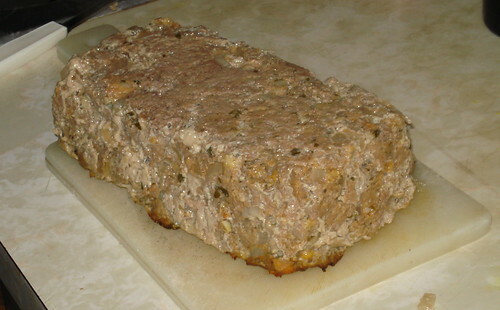 The recipe for meatloaf is in a chapter on roasting, not a collection of main dishes or meat dishes or dinners; other chapters treat grilling, frying, braising, sauces, and microwaving, among others. His purpose is not just to show you how to make particular dishes, but to teach you the principles, the science of cooking. I like Alton Brown. 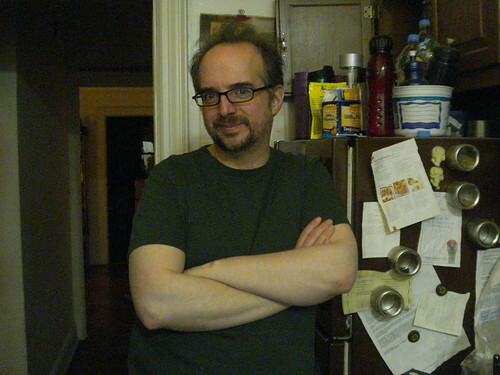 I’m a big fan of “Good Eats,” and I really like his enthusiastic, detail-geekery approach to cooking and cooking instruction. But I hadn’t used this book before, except to double-check a few process questions (and I don’t remember either the questions or the answers). 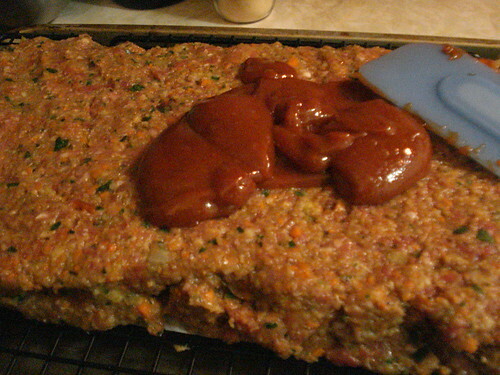 I decided to make meatloaf because I thought it would offer an interesting comparison between Alton Brown and Martha Stewart’s styles of cooking, and they do take different approaches. Where Martha has you blend three different meats, Alton directs you to use just beef chuck — and, preferably, to select a chuck roast and ask the butcher to grind it for you. (Which I did, at Whole Foods, and they were very nice about it.) 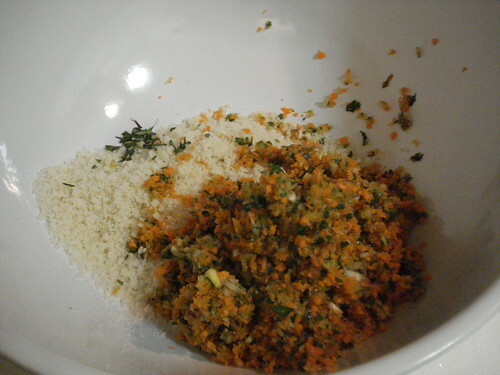 Martha’s recipe includes carrot and celery among the add-ins; Alton’s does not. 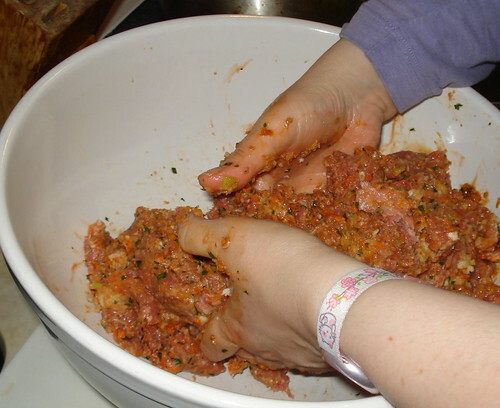 Martha directs you to process the bread and the vegetables to crumbs, making for a very fine distribution through the loaf; Alton has you mince the onions and bread into fine dice, so that they are slightly more noticeable within the mixture. The biggest difference, though, is that Martha has you bake the loaf exposed, atop a rack, so that the fat renders out as it cooks and the glazed surfaces brown. Alton’s recipe in I’m Just Here for the Food has you bake it in the pan, then pour off the rendered fat after the loaf has rested. This surprised me. I distinctly remembered a “Good Eats” episode in which the loaf is exposed for baking and glazed, very similar to Martha’s, and I was a bit taken aback to see the in-pan version in the cookbook. But I followed it, because part of the point of this whole project is to see what happens when I follow the instructions and don’t try to second-guess or improve on everything. 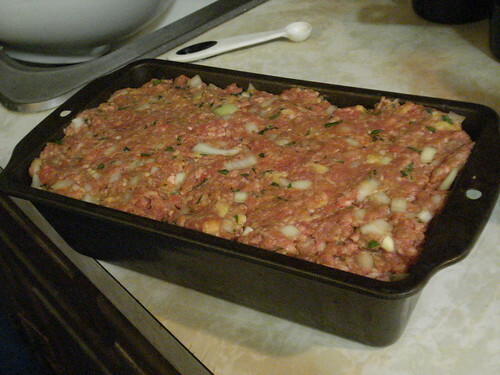 The preparation process for Alton’s meatloaf is pretty similar to that for Martha’s. 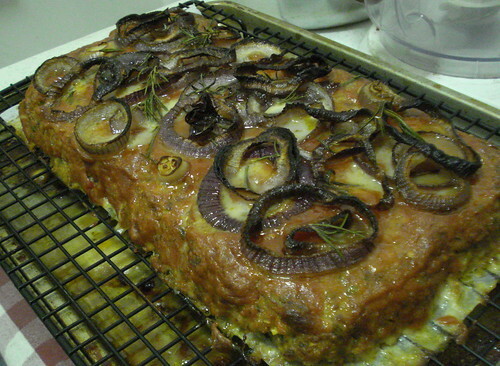 I used my hands to blend the meat with the ingredients — in this case beaten eggs, diced onion, minced garlic, bread crumbs, ketchup, paprika, red wine vinegar, Worcestershire sauce, salt, pepper and parsley — and then shape it into the loaf, but in a pan rather than on a rack. I baked it for an hour and 15 minutes, then let it rest for 15 minutes. 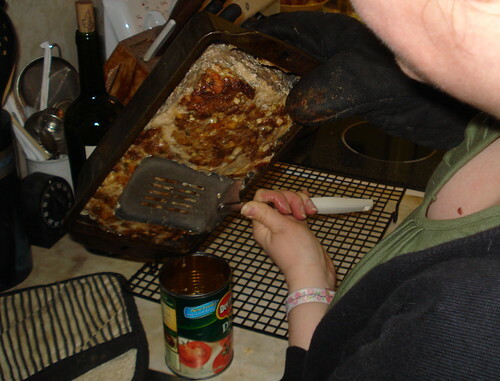 At this point I poured off the fat and liquid that had rendered out; that took up more than half of a 16-ounce can. 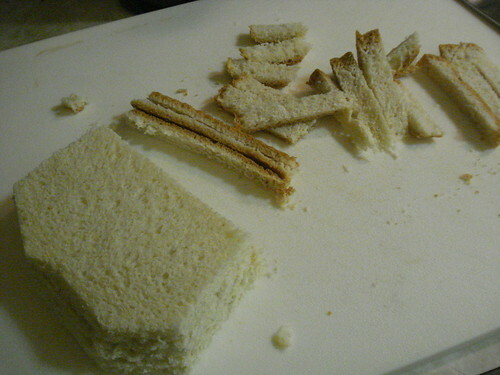 Then I turned out the loaf, which, predictably, was not browned. 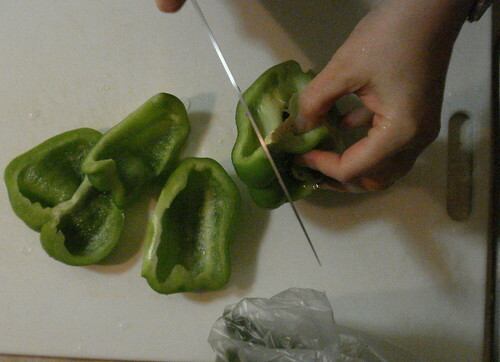 I cut a few slices for serving; they were soft and prone to falling apart. 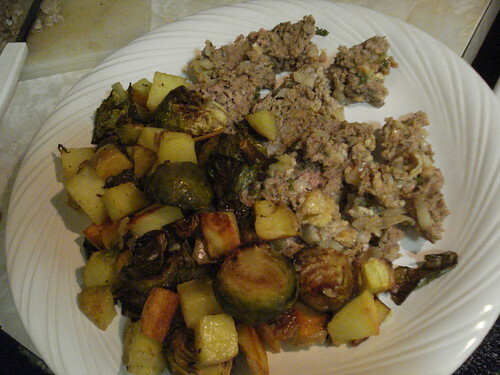 As I did last week, I served the meatloaf with roasted Yukon Gold potatoes and Brussels sprouts. 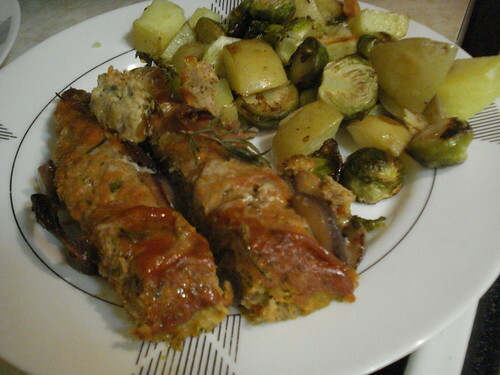 The meatloaf was good: flavorful and rich, but not greasy. I missed the browned, glazed edge a bit. 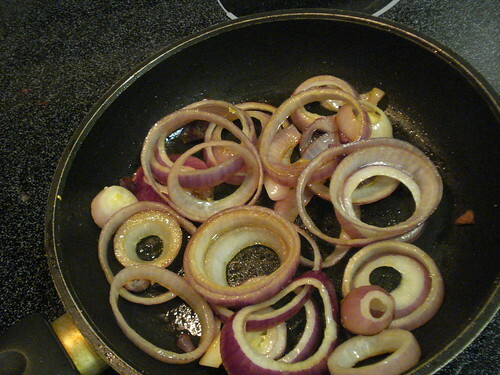 The onions were fairly noticeable, but were well-cooked enough for my taste; in the recipe notes Alton says he likes to sweat the onions before mixing them in, and I think I’d do that if I make this again, just to make them a little softer and less of a contrast with the texture of the meat. 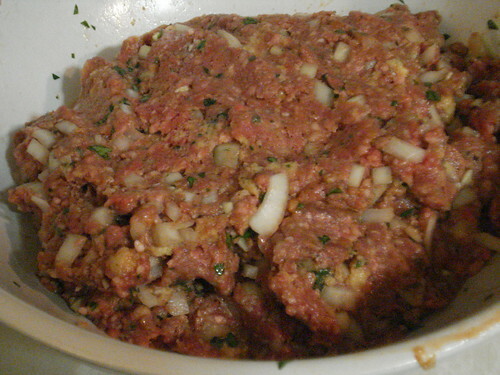 But I’m not going to be in any hurry to make more meatloaf; it’s still not my comfort food, not something that I’d go out of my way for. Verdict: Success. 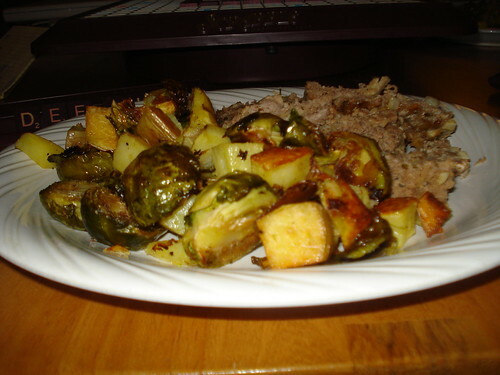 Flavorful, hearty, and very easy to make, if a bit messy to clean up after. Everyday Cooking With Dr. Dean Ornish is not just a cookbook but a diet and lifestyle plan. The follow-up to his previous offering, Eat More, Weigh Less, this volume presents recipes that are intended to help people improve their heart health and overall fitness through a high-fiber, very-low-fat diet. And Everyday Cooking is also meant to be easier to cook with than the first book, presenting recipes that can be prepared quickly, with simple prep and fresh, inexpensive, easy-to-find ingredients. 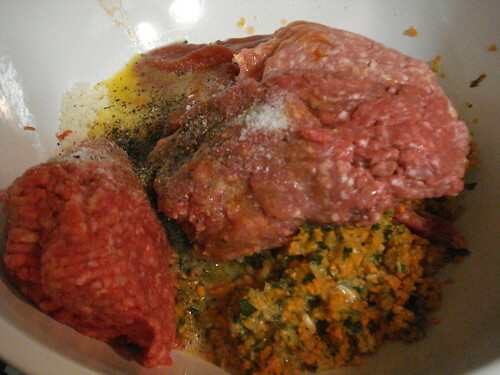 You could say that both Eat More, Weigh Less and Everyday Cooking are the antithesis of the Atkins-style protein diets. 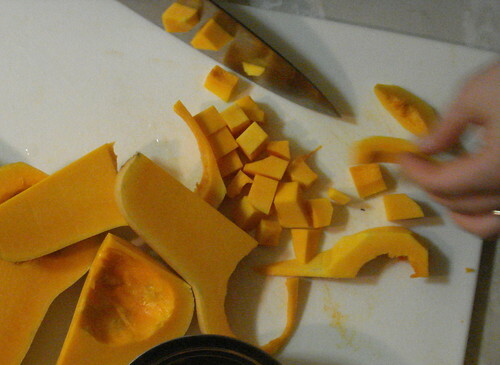 Dr. Ornish, a physician and researcher in heart disease, argues that the way to reverse heart disease and improve other markers of health is to change your diet and lifestyle by eating low-fat, high-fiber, high-nutrient foods and follow a program of regular exercise — not just to rely on surgical intervention or powerful prescription drugs. The Atkins crew endorses the exercise, but thinks the way to improve health through diet is to cut out low-fiber simple carbohydrates and eat plenty of protein, and not worry about fat. I’m not going to spend a lot of time researching the ongoing debate between the camps, and I’ll take for granted that my readers are smart enough to know that eating a pound of bacon at a sitting isn’t exactly the letter or spirit of the Atkins plan either. But I’ve tried a protein diet and I’ve tried the Ornish plan. I didn’t stick with either long enough to make it a permanent lifestyle choice, but I can confirm that the recipes in Ornish’s books are a lot less likely to make you want to throw yourself out a window. 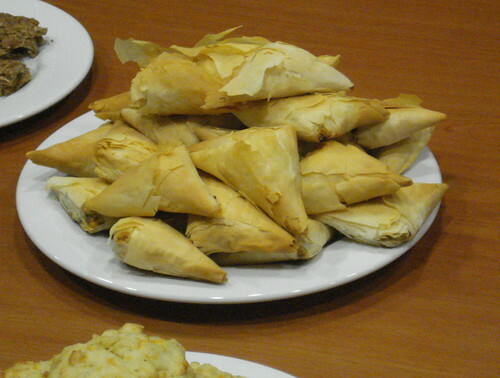 Everyday Cooking has a lot of tasty offerings. Pear-ginger muffins. Arugula salad with corn and red onions. Herbed mushroom risotto. 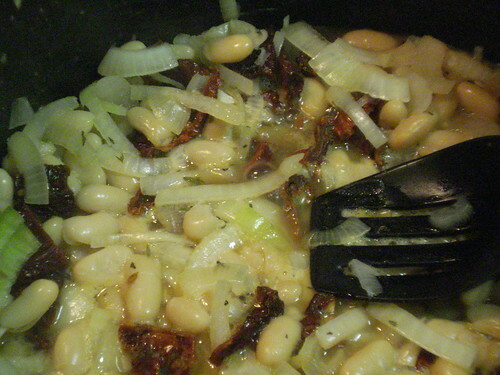 Two-bean enchiladas. What you will not find in the books is meat dishes, not because of any ideological opposition but because the plan sets a limit of 10 percent of dietary calories from fat and zero dietary cholesterol, which is impossible to achieve with meat in the mix. But Dr. Ornish makes clear that what you’re giving up in traditional carnivorism, you’re gaining in flavor and variety as well as health. 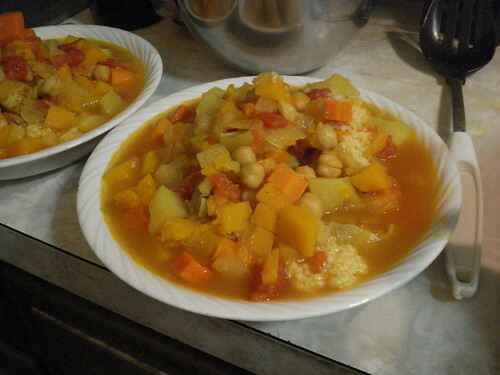 The book’s recipes are arranged seasonally, so I followed a menu from the fall chapter. In principle I was supposed to serve the pasta and spinach with crusty Italian bread, but there was no need — we had plenty of food. (It’s possible I overlooked some guidance from Dr. Ornish on portion size.) I started cooking last night, right after I’d gotten home and cleared away the few remaining daytime dishes, so it was a good test of the “everyday” claim. 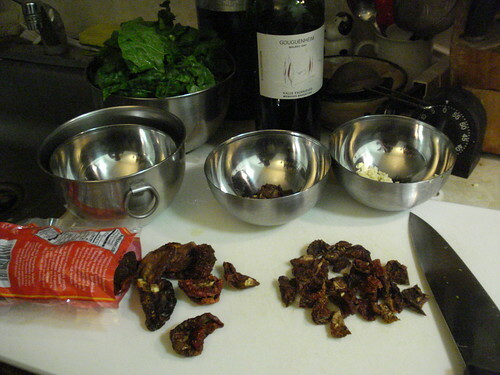 I started by doing my chopping prep: a bunch of fresh spinach washed and the large stems pulled out, a few cloves of garlic minced and divided, a cup of sun-dried tomatoes (dry-pack) cut into quarters, and a cup of onion sliced, followed by a few minutes flushing my eyes. 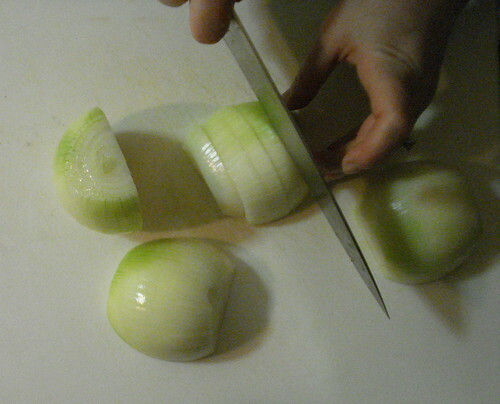 Damn, those were strong onions. 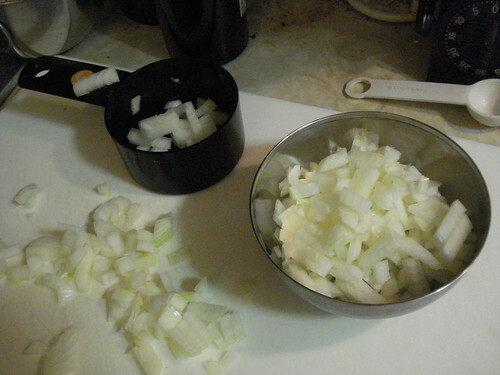 Once I’d recovered, I heated about 1/4 cup of vegetable broth in a large pot, then added the onions and garlic and let them cook for about 5 minutes, until the onions were soft. 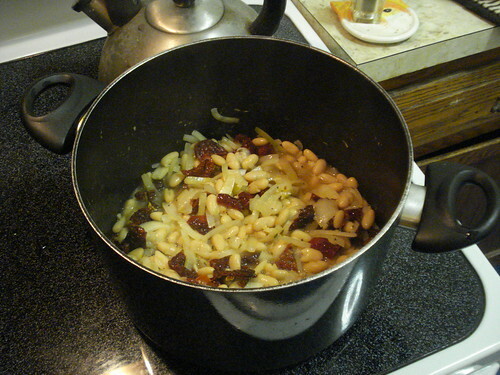 At this point I added the sun-dried tomatoes, two cans of cannellini beans with their liquid, some dried thyme and basil, and another 3/4 cup of broth, and let the mixture simmer together for about 15 minutes. 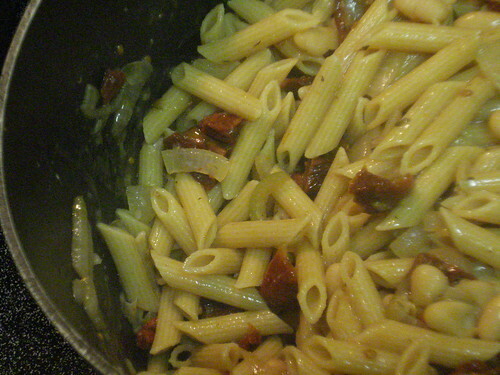 Near the end of that time I set water to boil to cook the whole-wheat penne. 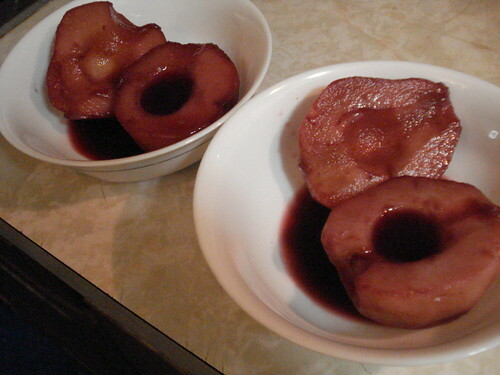 While the bean mixture cooked, I peeled, halved and cored two pears and set them aside. 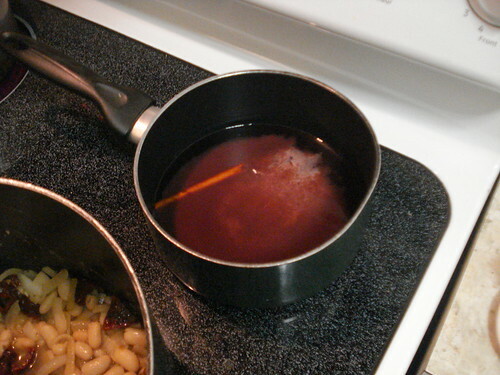 In a moderate saucepan I combined red wine, sugar, orange juice concentrate, lemon juice, a cinnamon stick and some vanilla extract, and brought the mixture to a simmer. 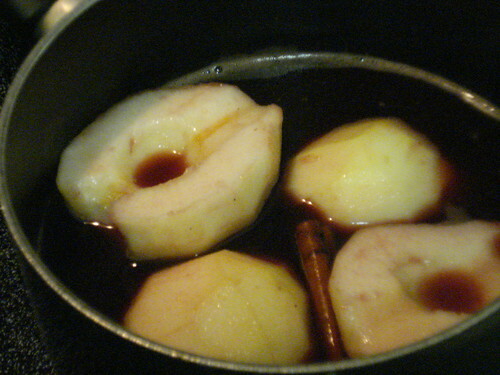 I let it cook for about 5 minutes, then added the pears and simmered them gently for about 8 minutes. When they were done I set the pan aside to cool. According to the recipe I was supposed to have made this earlier and chilled it, but it was cool enough by the time we were ready for dessert. When the pasta was about 5 minutes from being done, I heated some vegetable broth in a skillet and added some minced garlic. 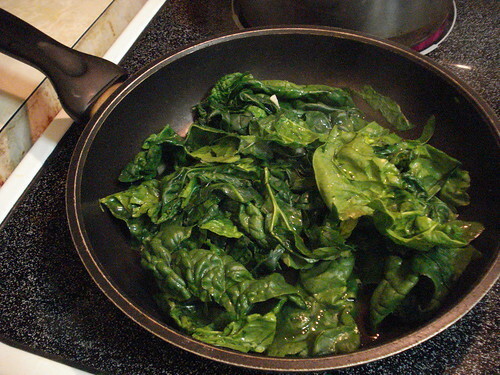 Then I started adding the spinach in handfuls, letting it sit a moment to start wilting before adding the next handful. 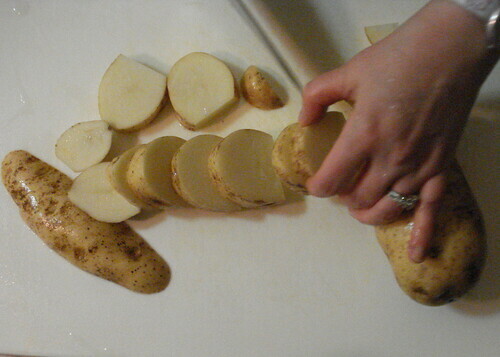 It didn’t take long to get it all into the pan, where I tossed it and added a bit of salt and pepper to season. 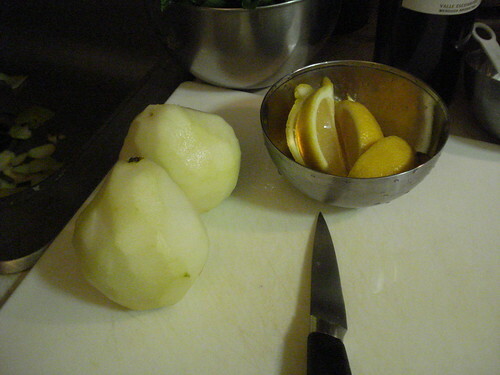 I cut a lemon into wedges and served out the spinach with lemon on the side to squirt over it. 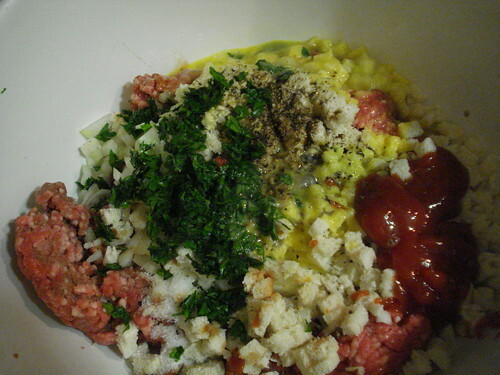 I added a bit of salt and pepper to the bean mixture, then drained the cooked noodles and mixed them with the sauce. 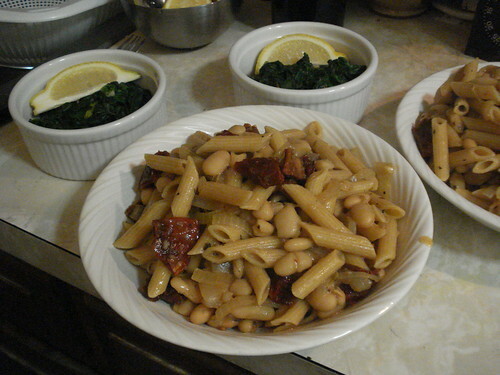 The pasta dish was hearty and satisfying. The spinach was fresh and delightful, and the lemon was a good, tangy accent. The pears were simple yet elegant. The meal was rich and savory. And, hey, did you notice how there was no added oil? I’m a big fan of olive oil and butter, make no mistake, but this dinner was a good reminder that with the right recipes you may not miss them. Verdict: Success. 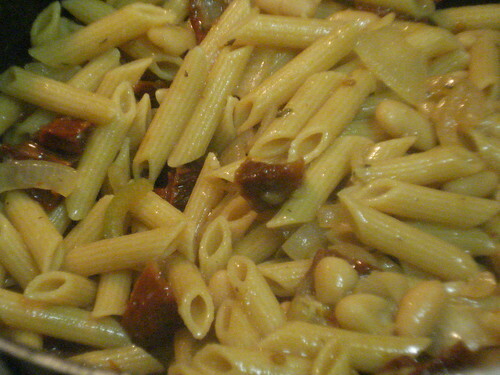 And we have quite a bit of leftover pasta, which will be good, since I may have to work late a few times this week. We’re back, babies! 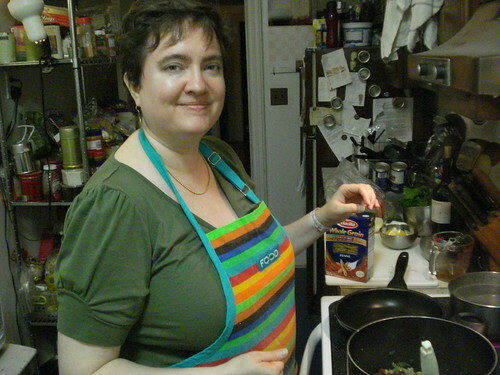 I’m still catching up with the rest of my life, but it’s time for another 107 Cookbooks post, with dinner cooked using the new stove. You can see it in the second photo at right. Isn’t that nice? 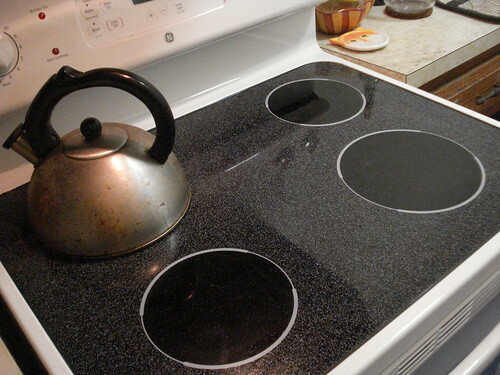 A smooth ceramic top, and it heats quickly and efficiently. The oven works well too, but wasn’t needed for tonight’s recipe. Vegetarian Express is a book I’ve owned for some years, and used to be one of my go-to cookbooks. If I had a dollar for every time I’ve made the rotini with spinach, chickpeas and sun-dried tomatoes…well, I probably couldn’t retire tomorrow but I could at least get a new MetroCard. I stopped using it as much when I began eating meat again, but frankly, I should add it back into the regular rotation, because the recipes are good and the preparation is pretty quick. It’s clearly written, too; the instructions are neatly organized, and the recipes are arranged in menus so it’s easy to assemble a wholesome dinner. The cookbook promises meals within 30 minutes. I didn’t quite reach that tonight — it was more like 60 — but that’s partly because I hadn’t organized the ingredients as well ahead of time as I might have and partly because I didn’t have enough clear counterspace to streamline my prep. But it was straightforward nonetheless. 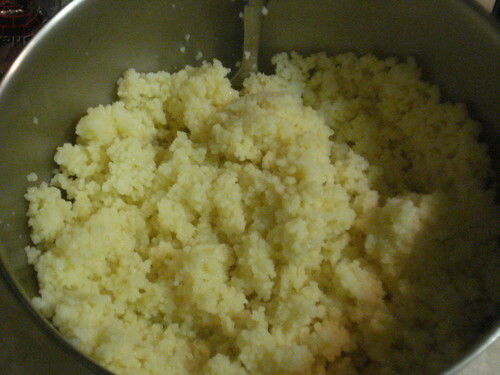 I started with the rice, which I made in a rice cooker. (It was supposed to be brown rice but I didn’t have any.) 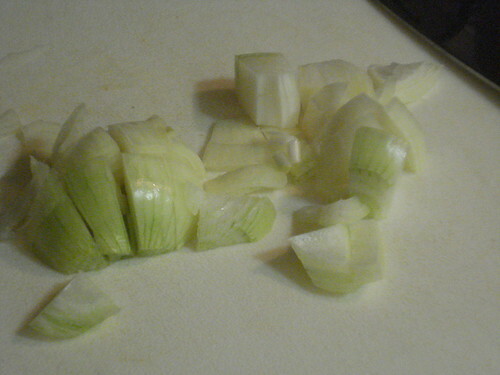 While it cooked, I prepared the lettuce for the salad, then diced onion, green pepper and garlic for the stew. 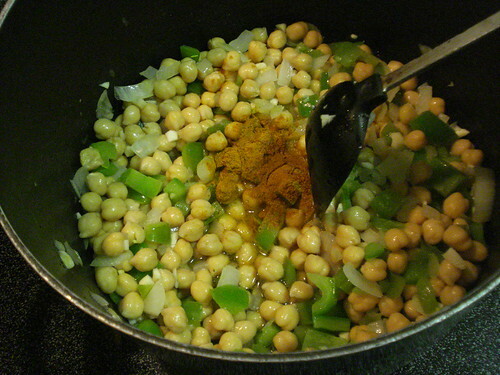 I heated some olive oil in the stew pot and sauteed the onion and green pepper, then added garlic, chickpeas (canned, rinsed and drained), curry powder (a nice hot blend from Penzeys) and some water. 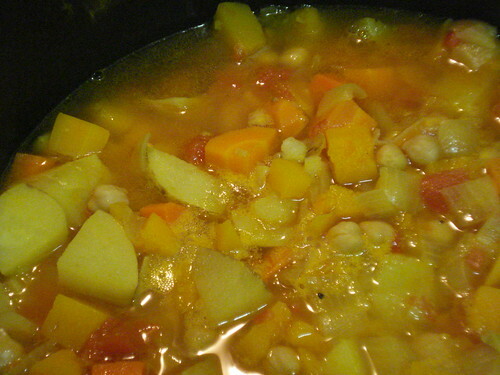 This first stage of the stew cooked for about 5 minutes. And I spent a few minutes being grateful to have a working stove. 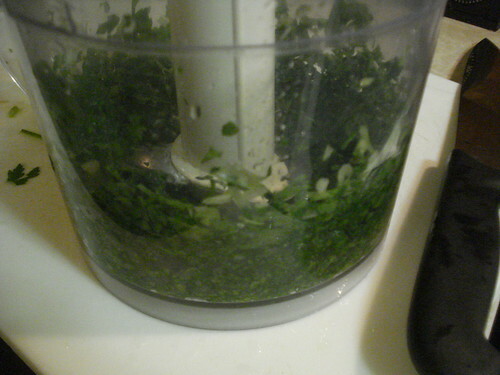 While it cooked, I cut the large stems off the parsley and chunked up some scallions. 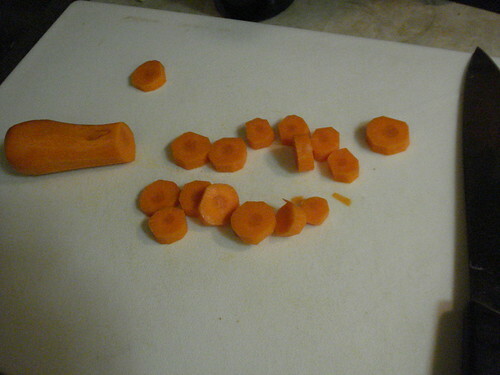 These went into a food processor to mince. 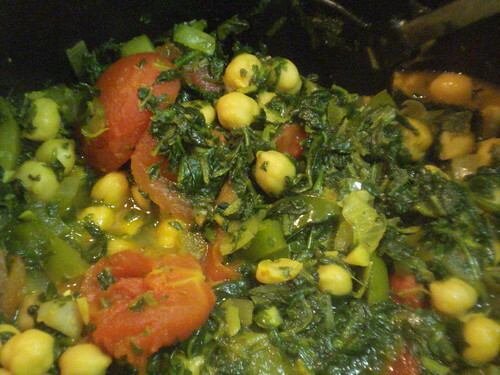 I set them aside and tended to the next stage of the stew: I added a can of sliced tomatoes with the liquid, two 10-ounce packages of frozen spinach that had been thawed and squeezed, and a bit of salt. This cooked for another 10 minutes. By this point the rice was done. 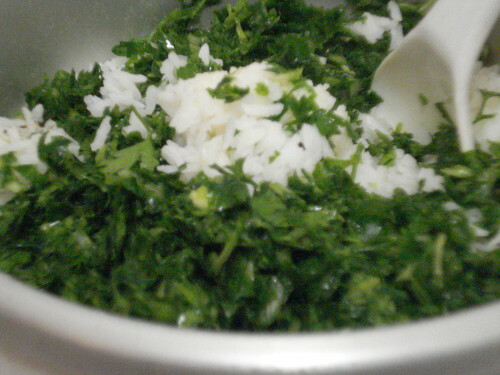 I had forgotten to melt two tablespoons of butter, but I cut the cold butter into the rice and let it sit for a moment to melt, then stirred in the parsley and scallions along with some salt and pepper. I mixed this up well and let it sit warming in the cooker for a few more minutes while I finished chopping celery and rinsing cherry tomatoes for the salad. 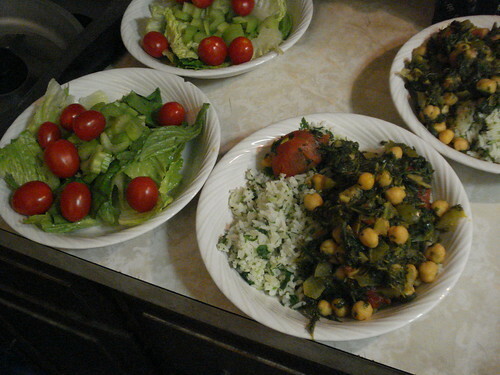 Everything was ready, so I put some rice into bowls, then topped it with the stew, and dished up salad. Verdict: Success. 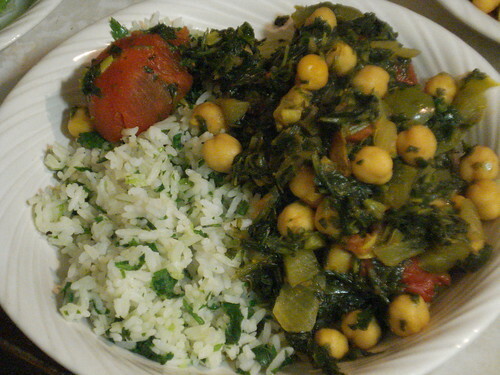 The stew was tasty, with a good blend of flavors; the spinach, tomato and curry blended well, and the rice was a good base for it all. (Brown rice would have been good too.) 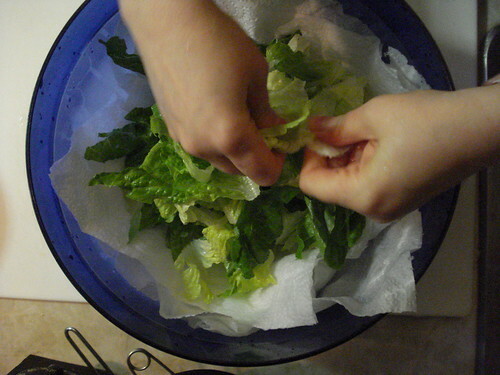 The prep was simple and it was easy to keep things organized and to clean up afterward. 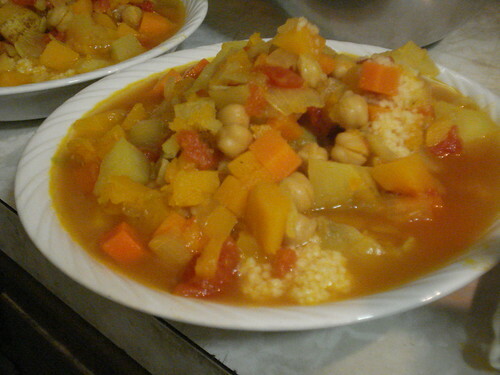 I will be making this again, and using the cookbook again.